Work on Cardiff's delayed new bus station could finally begin next month. The city-centre station was demolished in 2015 as part of Central Square redevelopment. Several plans have since been proposed - but work has yet to get off the ground. Cardiff council will hold a key meeting next week - where officials are expected to sign off final plans for the scheme. Ahead of that, a deal has been struck between the local authority, developers Rightacres Property and the Welsh Government. It will secure offices as part of the scheme and means work can start without a tenant having to be secured first. 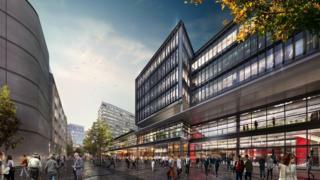 It will also see Cardiff council hand over its leasehold interest in one part of Central Square to the Welsh Government, which has not yet been disclosed. Final plans submitted by developer Rightacres are set to include a 14-stand bus station, retail space as well as offices and apartments. Russell Goodway, Cardiff council cabinet member for for investment and development, said in a report that "significant progress" had been made within the past month. He said: "Following an extraordinary meeting of the council's cabinet, the leader of the county council will make an announcement on behalf of the partners regarding the commencement of works." Cardiff council's cabinet will meet on 28 March.